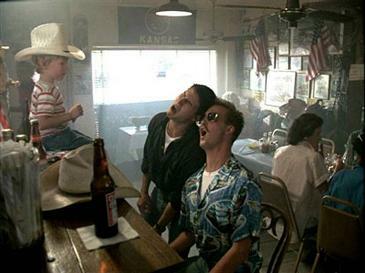 The iconic downtown barbecue restaurant where scenes from “Top Gun” were filmed will celebrate its 35th anniversary on Tuesday. Kansas City Barbeque on Harbor Drive was opened by Kansas City natives Cindy and Martin Blair long before the neighborhood became a tourist crossroads. Just a few years after opening, the Blairs allowed Paramount Pictures to shut down the restaurant to shoot scenes for the movie, which came out in 1986 and became an international blockbuster. After filming the scene where Goose (Anthony Edwards) plays the piano and sings “Great Balls of Fire,” and Goose’s wife (Meg Ryan) says “Take me to bed, or lose me forever,” the director asked if they could return a month later to shoot the movie’s final scene, in which Maverick (Tom Cruise) and Charlie (Kelly McGillis) reunite as “You’ve Got That Lovin’ Feelin’” plays on the jukebox. The real Navy Top Gun staff used to hold meetings at the restaurant before the flight training school relocated from Miramar to Nevada. The restaurant will celebrate the anniversary Monday through Friday, May 14-18, with discounts of appropriately 35 percent on their popular Baby Back Rib dinners. 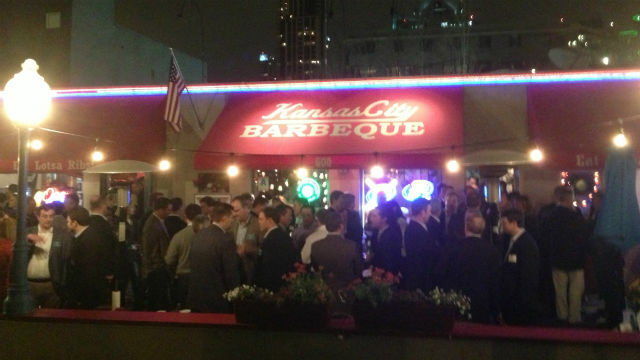 Kansas City Barbeque is open from 11 a.m. to 1 a.m. daily, with the bar open until 2 a.m.